‘If the Invader Comes’ is a film installation by photographer Dan Dubowitz and choreographer Fearghus Ó Conchúir that responds to the Martello Towers of England’s East Coast and to the ‘land’s end’ psyche of their coastal communities. These coastal defences attest to a psychology of vigilance that has animated the towers since they were built in anticipation of a Napoleonic invasion. ‘If the Invader Comes’, is the second collaboration by Dubowitz and Ó Conchúir that investigates the relationship between people and place. ‘If the Invader Comes’ is shown alongside their first joint work, ‘Tattered Outlaws of History’. The Martello towers were built along the coasts of south east England and Ireland as an early warning system and defence line against a Napoleonic invasion but Napoleon never came and these towers never fired a shot in anger. Since then, the towers have been outsiders, a series of misfits. 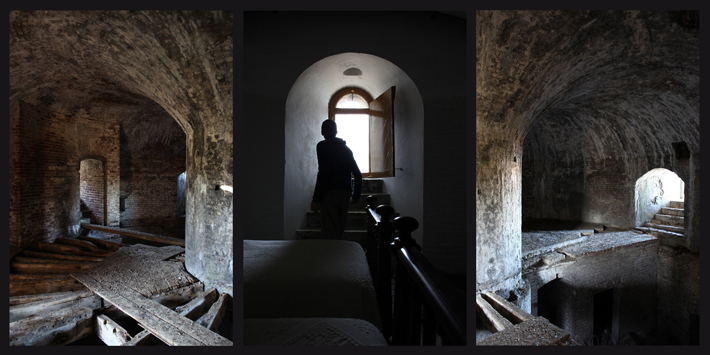 Dubowitz and Ó Conchúir were commissioned in 2010 to make a new work developing the ideas explored in ‘Tattered Outlaws of History’ with a residency at Jaywick Martello Tower, Essex. Using Jaywick as a base, they embarked on a journey to get into all the east coast’s towers, meeting their custodians, getting to know the towers singularly and as a series to better understand their spirit. The state of the Essex and Suffolk Martello towers differ enormously, from sublime ruin at one extreme to a tea room with lamas or elegant homes with commanding views at the other. The artists have, in this new commission, focused on those derelict towers that are on the cusp of redevelopment. ‘If the Invader Comes’ takes its title from a World War II poster found in the Aviation Museum in the Martello Tower at St Osyth. The work centres around the theme of vigilance and control. It is a triptych presented on three adjacent screens. As the film develops the psyche of the tower emerges in the fragile embodiment of a solitary watcher and his dance with literal and metaphorical shadows. The work depicts vigilance but it also invites the viewer to identify with the watcher and to share his experience. In this moment of transition between ruin and redevelopment, the towers are in a state of flux and are open to the choreographic intervention that the artists bring. This notion of the towers in motion is counterintuitive, interrogating the assumption that these monolithic structures are fixed and solid. Some of the east coast’s towers have already been lost to coastal erosion, and the artists convey a sense of the Martello towers as having become ephemeral repositories of the fragile and the temporary. ‘If the Invader Comes’ is commissioned by Commissions East as part of Fleet: Art in the Haven Ports.